This year’s Phoenixville Firebird Festival will be held on December 7th, 2019 at Veterans Field, 192 Mowere Road, Phoenixville, PA. Click here to visit the official website and click here to follow them on Facebook. 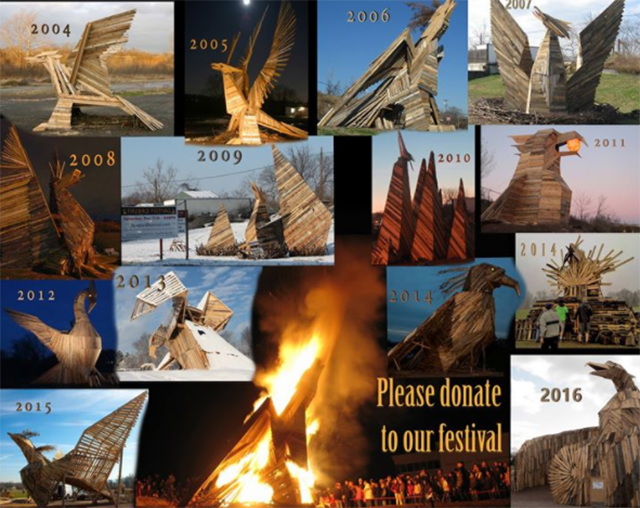 Phoenixville, PA — Since 2004, Phoenixville has celebrated the “rebirth” of the town with an annual burning of a large wooden Phoenix that is built by volunteers in the months before. The bonfire at the Phoenixville Firebird Festival is filled with clay birds that are crafted over the preceding weeks at Community Arts Phoenixville, acting as a kiln to harden them. 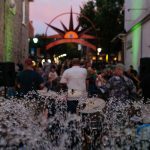 The Firebird Festival is designed to foster a collaboration of local artistic and creative talent and to enhance the overall cultural life of Phoenixville. The event features over 100 performers, craft vendors, and gourmet food trucks from Philadelphia and the surrounding area. 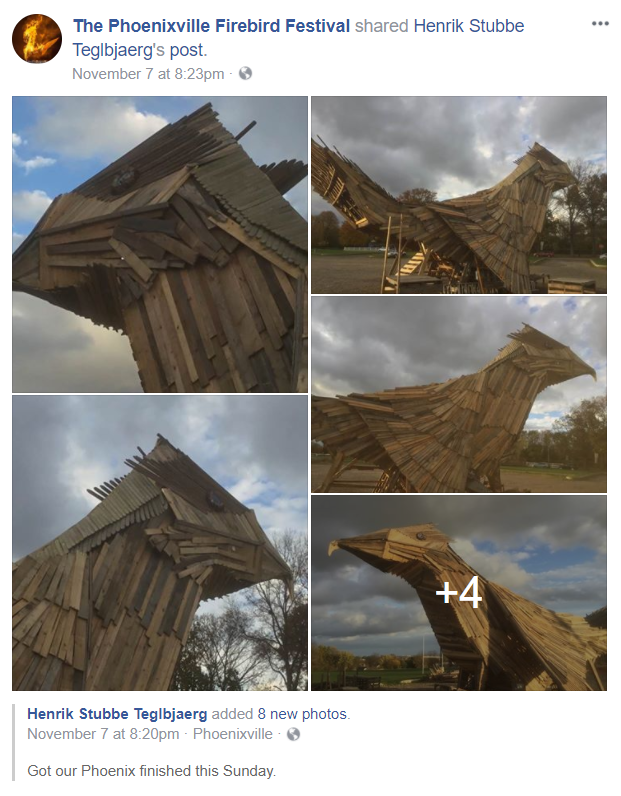 In 2014, someone torched the large wooden structure of a Phoenix the morning of the Phoenixville Firebird Festival. 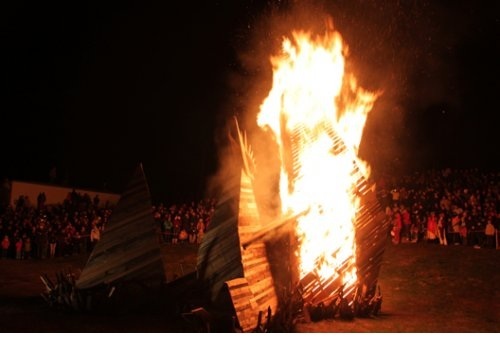 However, festival organizer Henrik Stubbe-Teglbjaerg, volunteers and members of the community rallied together, new wood was donated, and a new structure was built in just eight hours … and in time for the bonfire to continue as planned. 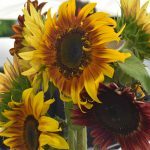 Editor’s Note: I have not yet had the pleasure of attending the Firebird Festival; however, I hope to this year. 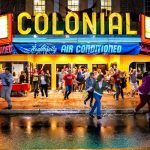 Over the past several months, I have seen the community come together quite a bit to support this unique festival through various fundraisers, with many local restaurants in Phoenixville participating, so I am very much looking forward to this event. This event is very dependent on community donations and volunteers, so please remember to make a donation and help in any way that you can. At the intersection of the Schuylkill River and French Creek, Phoenixville PA is the perfect blend of urban experience and historic small town charm. Chuck and I consider ourselves lucky to have discovered it and plan to spend the rest of our lives here!